SINGAPORE - Restaurants at the IMM shopping mall in Jurong can now outsource dishwashing to an in-house facility. It is Singapore's first centralised dishwashing facility located in a shopping mall, and was set up in March to address the restaurants' woes in hiring dishwashers and to boost productivity in dishwashing. "There is an economic case to centralise dishwashing, because we save manpower and space that can otherwise be used to generate income," said Deputy Prime Minister Tharman Shanmugaratnam after visiting the unit with members of the National Productivity Council (NPC) yesterday. "We are using this as a pilot so that we can learn what the problems are," added Mr Tharman, who chairs the council. A problem identified in the pilot was the lack of a service corridor to link the restaurants and the facility. Crockery is now collected in trolleys that are pushed through the mall. These are obstacles that have to be overcome, said Mr Tharman, promising a review of whether changes to building regulations are needed to set up service corridors. The dishwashing facility is the latest move to encourage centralisation in labour-intensive sectors to boost productivity. Last month, Mr Tharman announced a $20 million pilot project to use technology to consolidate and coordinate deliveries to shopping malls. IMM's dishwashing facility is about the size of six Housing Board five-room flats, and is tucked away in a former warehouse on the fourth floor. It is operated by home-grown firm GreatSolutions, which also runs another dishwashing facility in Senoko that is about 11/2 times bigger. Landlord CapitaLand Mall Asia renovated the former warehouse in IMM to make it a cleaning facility for about $1.2 million, with Spring Singapore subsidising $840,000. It was then leased to GreatSolutions, which invested $1.3 million in machinery, including an undisclosed Spring subsidy. 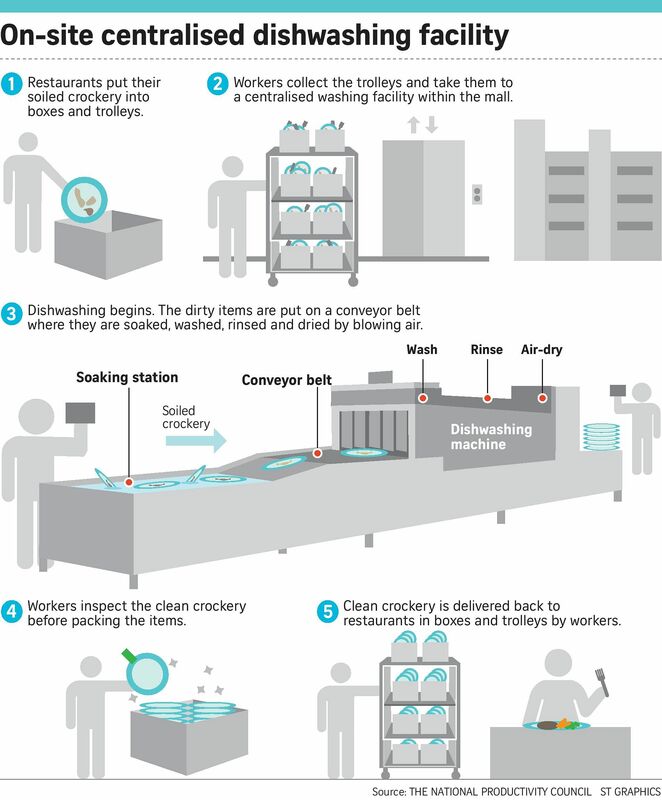 The cleaning facility has seven semi-automated dishwashing lines, including a separate line that washes crockery from halal-certified eateries. Each line, manned by four workers, can wash up to 5,000 pieces of crockery in an hour. GreatSolutions' special project manager Eliss Pang, said restaurants can save money by outsourcing their dishwashing. Lian Peng Bak Kut Teh restaurant, which started operations in the mall in September, now pays $2,500 each month for outsourced dishwashing, with Spring giving a monthly subsidy of $1,750, for one year. "Hiring dishwashers and cleaning chemicals would have cost us about $5,000 each month," said its business development manager Tommy Ng. "We also added 10 seats in the restaurant after doing away with the dishwashing area." The facility can serve 100 restaurants but only 19, including six in IMM, have signed up so far. Ms Pang said some eateries may have already invested in equipment or have existing contracts. "The take-up rate will improve."